Bee Playing Cards are top-of-the-line, U.S. made decks featuring premium playing card stock and a linen, air cushion finish. Bee Playing Cards are used in the leading casinos in Las Vegas, Atlantic City, Macau, and other gaming venues. The distinctive diamond back design, without a border, makes the face of any card that is even partially revealed clearly visible. Bee Playing Cards are available in Poker-Regular Index, Poker-Jumbo Index, and Pinochle-Regular Index. Bee Playing Card Decks are in stock for immediate shipment. Decks are shipped half blue and half red. 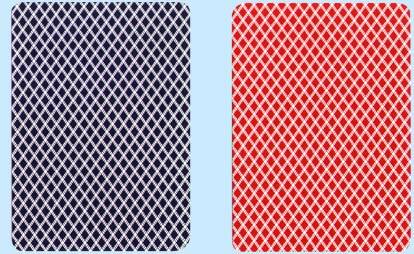 For example, a Dozen Bee Decks contain six blue and six red decks.